My and the community's understanding at the time was that the development would likely be tucked away behind the existing built-up area, and that the solution would see a "[g]reen corridor through Rochester Field to be re-designated to parkspace and enhanced" (see the .pdf below). Later in 2015, a first proposal was made to re-designate part of the land for development along those lines, and in the most general terms possible (a re-designation to general urban area). That proposal created some debate, but not close to the current dissatisfaction I've heard expressed. 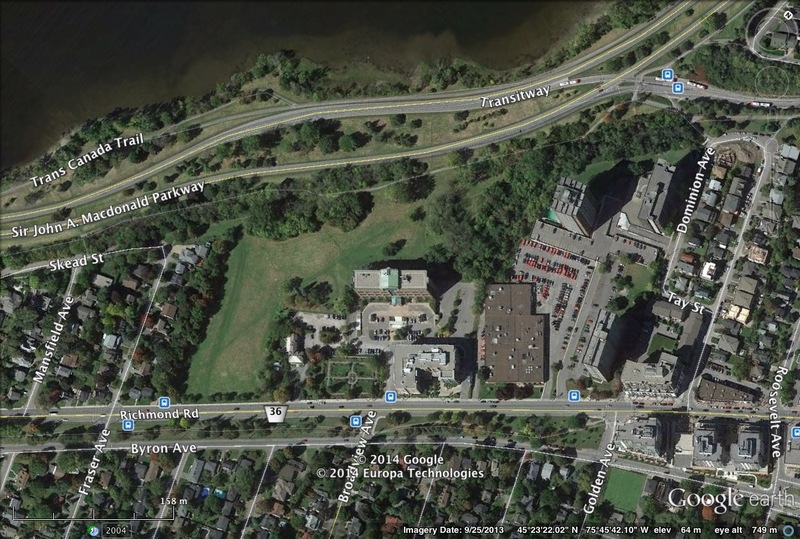 However, since then the NCC has done further consultation on the whole of its Sir John A. Macdonald Parkway linear park concept. During those consultations, it showed several concepts for how the land might be developed. Out of those, it has developed a proposal that would see the 90m immediately north of Richmond Road developed, with a path running north-south between buildings, and the back of the site re-developed as a park. You can see more about that by watching the video of the NCC's board meeting at which it approved that concept here. To facilitate that, it is seeking a more specific re-zoning than just general urban area, asking for those first 90m to be zoned traditional mainstreet. That zoning would allow a variety of uses including residential and commercial to a height of around 6 storeys. Finally, it struck me after Wednesday's open house that there are analogies between this re-zoning/Official Plan Amendment and the approach to re-zoning for the Civic Hospital. In both cases details will follow the zoning. To address that for the Civic, staff have proposed placing conditions that will need to be met before the zoning is finally in effect and development allowed. Council should insist on the same in this process. Potential conditions could include further public consultation on any designs, traffic studies and mitigation plans, or landscaping/tree preservation plans acceptable to the City and residents. "Upon execution of this MOU, the City agrees to settle the outstanding Ontario Municipal Board appeal by the NCC as it relates to Rochester Field by designating two-thirds in the northeast section of Rochester Field as "General Urban" land use designation subject to a Concept Plan to be done by the NCC and to be commenced no earlier than January 2016. The NCC acknowledges in this settlement that the remaining one third of the land area of the site on the western side will be retained as parkland with a “Major Open Space” land use designation and may be credited towards parkland dedication requirements for the development of the eastern portion of the site." In light of that, it is difficult to reconcile the NCC's current proposal with the spirit or letter of its written agreement with the City. The originally proposed Official Plan Amendment would have met this requirement. I have been receiving a significant amount of feedback on what we heard Wednesday, and I want to thank Kitchissippi residents for their thoughtful engagement with this. It is far from certain in my mind that we should proceed with this re-zoning, and I'll be bringing the considerations above to the table when I meet soon with the City to discuss this process. Your feedback to me has been invaluable in crystalizing some of the considerations above in my own thinking, and I'm looking forward to your further participation.